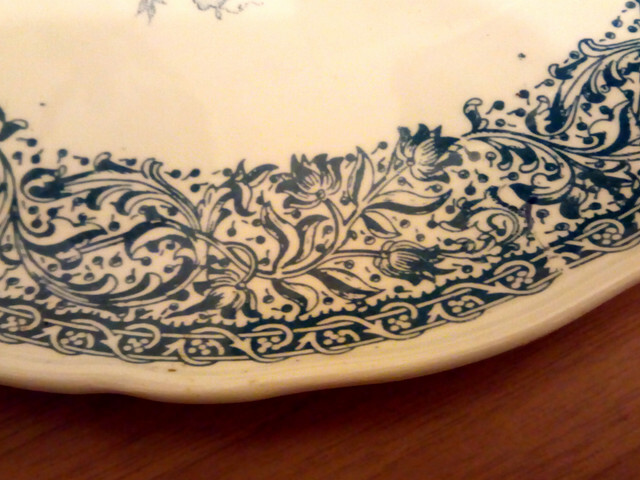 i would like to date and identify this old plate . Looks similar to the Sutherland china mark but not quite like the ones iv seen worth a try though. lacking an England mark but still in English another possibility is american? 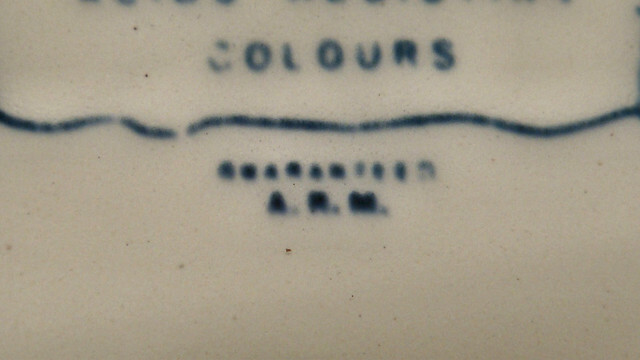 Its English pottery due to the spelling of "colour"
"Acids resisting colours" odd, but if correct maybe a clue. Perhaps the footnotes of 'acid resistant' etc provide a clue. A commercial pottery supplying wholesale to the burgeoning Victorian tea shop/restaurant/work place whatever of the 19th century. A market that is often overlooked. In that the antique market is prejudiced in favour of the upmarket Doulton/Wedgwood/Worcester producers in terms of value. Having virtually completely ignored the Victorian Mass market. Which given that such potteries were supplying most of the rest of the world at the Zenith of British trade and ceramic production. So there you are. A mass market piece! Can't make out the word above ARM, Manufacture?? Thanks to everyone .... most likely it is from the 19th century, I see the writing A.R.M. ... could be a further indication ? 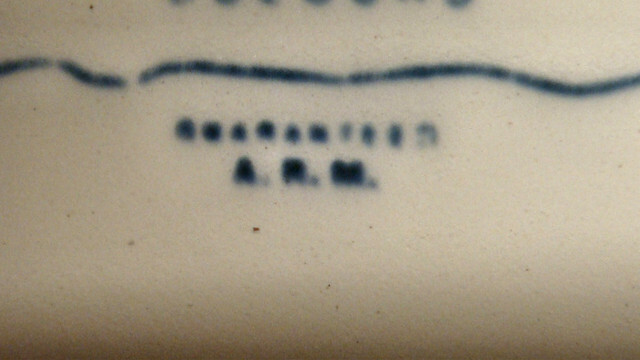 denbydump wrote: Can't make out the word above ARM, Manufacture?? yes i ll do my best, even if it's little and blurred on the ceramic . In my opinion, I don't think that there's any real age to it, probably 1950s or 1960s, if not later. For a start, the glazed foot ring looks awfully clean. The floral pattern alone is not a useful indicator of age; the taste for Victorian style comes and goes but never seems to disappear entirely, so you can find floral and landscapes inspired by Victorian patterns being produced at pretty much any time over the last 120 years. 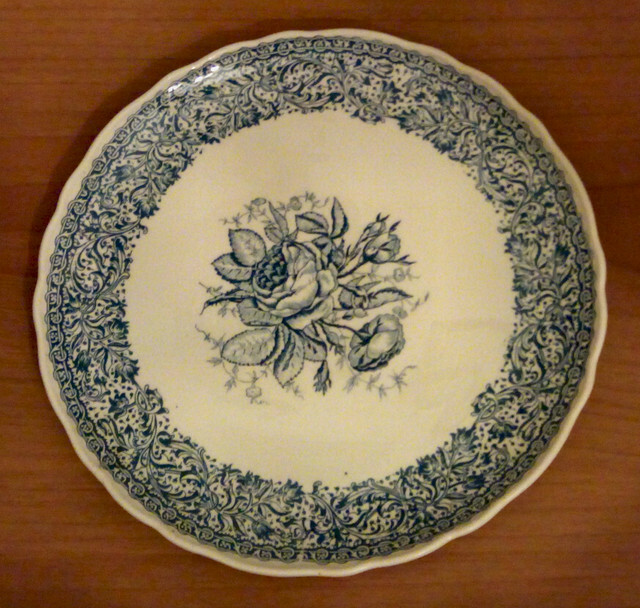 Johnson Brothers and several other Staffordshire factories, for example, produced similar wares in the 50s and 60s. 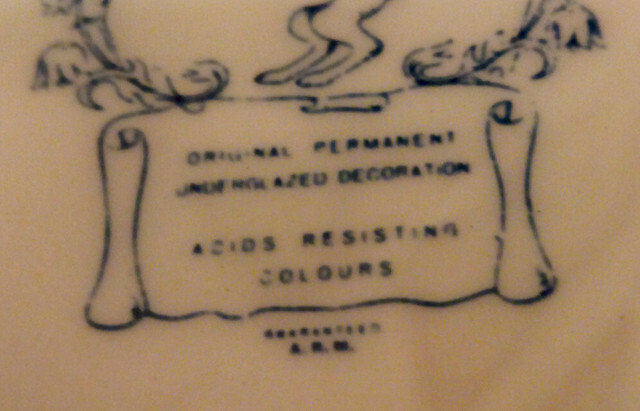 Moreover, 'original permanent underglazed decoration' isn't wording that any pottery would have used until the post-war period. 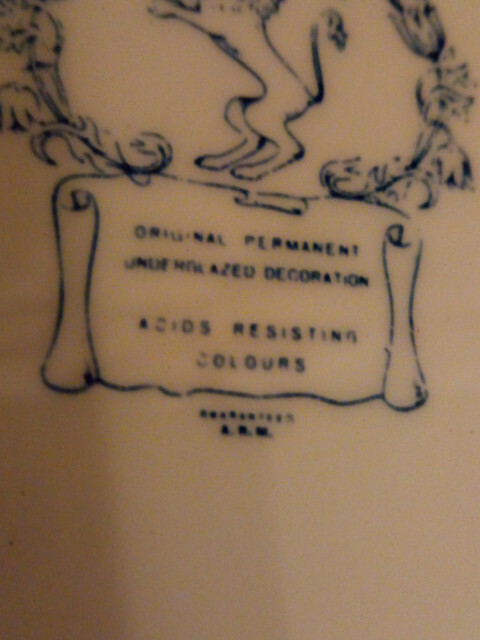 I really don't think this was produced in the UK either, because no self-respecting pottery would have used the misspelt 'acids resisting colours'. 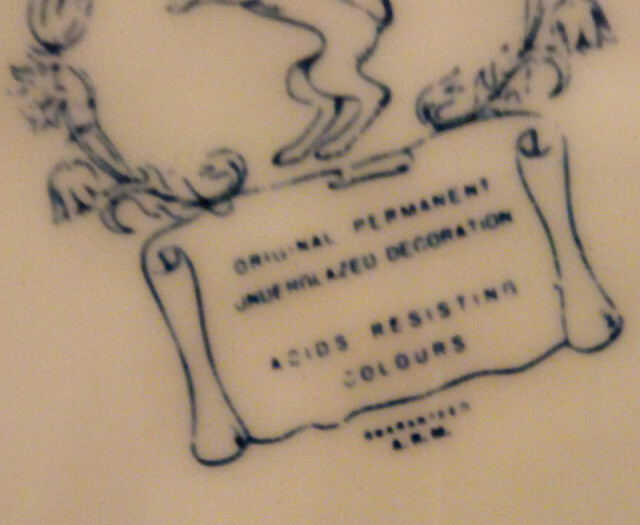 The crown and lion device, I reckon, were used to give the mark a form of legitimacy by imitating those of the established British factories and the English spelling of 'colour' would most likely have been copied from one of those factories' marks. Essenjay wrote: In my opinion, I don't think that there's any real age to it, probably 1950s or 1960s, if not later. For a start, the glazed foot ring looks awfully clean. 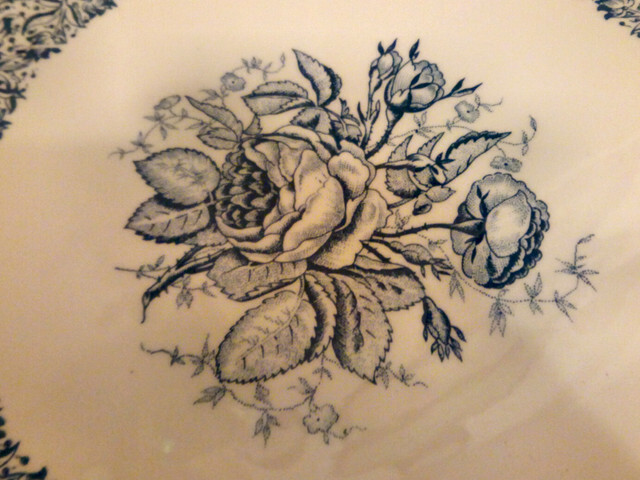 The floral pattern alone is not a useful indicator of age; the taste for Victorian style comes and goes but never seems to disappear entirely, so you can find floral and landscapes inspired by Victorian patterns being produced at pretty much any time over the last 120 years. Johnson Brothers and several other Staffordshire factories, for example, produced similar wares in the 50s and 60s. Thanks so much for your opinion, i think you're right .